Dec. 31, 2018—Midnight toasts are a festive way to ring in the new year. But that doesn't mean your celebration has to center around alcohol. Whether you're out on the town or enjoying a quiet evening at home, there are plenty of reasons why you might decide to go alcohol-free. After weeks of holiday indulgences, you could simply feel ready to take a break from all the rich food and drink. Or maybe it's your turn to be the designated driver. 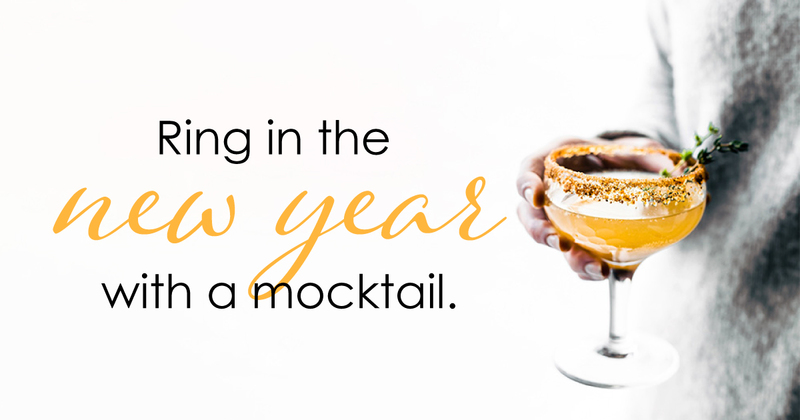 And if you're thinking about building healthier habits in 2019, you might start by passing on alcohol. Cutting out drinks is a good way to curb calorie intake to help reach weight-loss goals or maintain a healthy weight. It may also lower your risk for certain cancers, such as breast, colon, rectal, liver, and head and neck cancers. Start with a flavorful base. Try an unexpected fruit juice or nectar like mango, apricot or cherry. Or brew and chill a bold-flavored tea like hibiscus or chai. Add some bubbles. Pour in some club soda, tonic or mineral water for a refreshing fizz. Finish with a fun garnish. Try chopped fresh fruit, berries, pomegranate seeds, fresh citrus wedges, fresh herbs or flavored homemade ice cubes. Use a fun glass. A champagne flute or crystal tumbler can make any drink feel special.